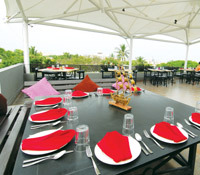 Ita��s their first day of trials and we end up at the rooftop al fresco section of Hola, on Besant Nagara��s 4th Main Road. While other diners under the white cabana a�� that has made its way from the UAE to Chennai a�� take turns at spotting ships through a telescope from the 1815s, we are rooted to our seats. Therea��s something intimidating about the ridiculously large table wea��re seated at, the near 10-page menu packed with information that would take an hour to peruse, and Mumbai-based restaurateur Mukesh Kaushik (walkie-talkie in hand) staring expectantly at us. Luckily, ita��s a tasting so we ask Kaushik to bring out his best before bombarding him with other pressing questions. Answering in quick succession, the former marketing professional, who now has 11 restaurants in three cities on his resume, reveals that Hola will open in Goa next week, while Chennai will get a second branch in Nungambakkam, next year. After that, taking his brand Delhi Highway, to London, NY and Dubai is priority, he says. The 95-cover Hola serves a mix of Mexican, Italian and Continental cuisine (for breakfast too), with plenty of chicken, mutton and seafood to choose from. And believe it or not, Kaushik, 31, a vegetarian self-taught chef, has added his personal touch to 90 per cent of the menu, non vegetarian dishes included. a�?I cook non vegetarian and others taste,a�? he shrugs, as we scrape up every last drop of sauce from the spicy chipotle chicken. Wea��re now inspired to try as many dishes as we can, but underestimate the rich, thick, four-cheese pasta that leaves us with space for little. 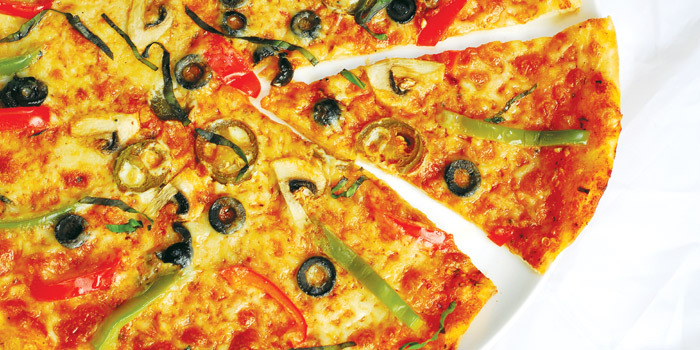 Thankfully, the thin crust pizzas here are so light that the whole 14-inches of fiery jalapeA�o, olive and tomato-laden goodness disappears in no time. Choosing a shrimp sizzler over stroganoff, lasagna, canelloni and so much more, we decide to call it a night. In a gravy of tomato, cheese and Mexican peppers, the shrimps and boiled veggies go well with a side of nachos. 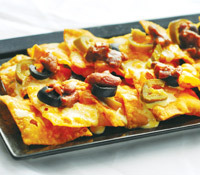 And we love that Holaa��s nachos are not drowning in cheese, ensuring they stay crunchy all through the meal. A frozen cheesecake later, Kaushik, who spends at least six days a month in the city (hea��s a regular at ITC Grand Chola and is currently taking cooking lessons from a customer in Mylapore, for an upcoming South Indian restaurant in New Delhi), takes us for a much-needed walk, to check out the posters of old movies and music concerts that adorn the walls of the restauranta��s indoor section.